Young women from local middle schools can participate at the annual Everyday Engineering camps this summer at RIT’s Kate Gleason College of Engineering. Sponsored by the college’s Women in Engineering program, the day camp activities are a fun way to learn more about science and math. WE@RIT, the Women in Engineering program at Rochester Institute of Technology, opens registration for its annual summer engineering camps for young women. The organization has also added two additional opportunities for high school students to explore the engineering field and to help lead some of the camp programs as leaders-in-training. Everyday Engineering Camps, the new Explore Engineering Program and the Leader in Training program will all take place at RIT’s Kate Gleason College of Engineering. Everyday Engineering consists of three separate, non-residential camp sessions for middle-school-age girls. The theme-based camps take place July 11–15 (World in Motion); July 18–22 (Robotics and More); and July 25–29 (Energy and Environment). Young women in grades 5–9 participate in engineering design projects, team building and recreation activities. Local high school teachers lead the camp activities. Guest speakers include RIT faculty as well as local professionals. The cost for the Everyday Engineering program is $300 per week. Family rates and discounts for multiple-week participation are available. The new Explore Engineering Program is for high-school-age students who want to learn more about the varied fields of engineering and the career options available. This one-day program is slated for 9 a.m.–4:30 p.m. Aug. 4. The cost for the program is $80. Participants will learn about various engineering disciplines, meet RIT women engineering students and faculty, experience the RIT campus and participate in a team engineering challenge. Applicants are also being sought for the Leader in Training Program. 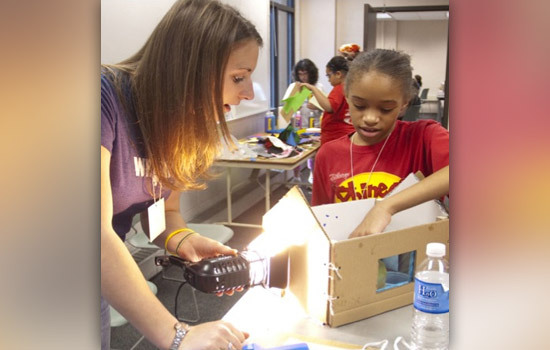 Prospective leaders, young women entering grades 11–12, apply for positions to help facilitate the Everyday Engineering Summer Camp with WE@RIT instructors. The cost for the program is $100. Those chosen as leaders attend leadership training and then volunteer for one of the three summer camp weeks. Scholarships are also available through an endowment established in 2010 by a donation from Harris RF Communications. The local company donated $100,000 to the engineering college to help provide support to area students without the financial means to attend the programs. WE@RIT is a multi-faceted program to support women currently enrolled in engineering programs at RIT and to encourage girls in grades 4-12 to consider engineering as a career option through programs like the Everyday Engineering Summer Camp. Each year, several hundred young women have attended some facet of the nearly 20 pre-engineering programs WE@RIT offers. For more information about the summer opportunities, contact we@rit.edu or call 585-475-6321.